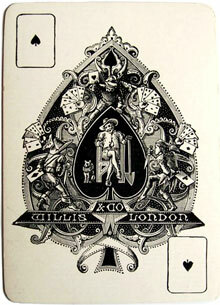 Willis & Company was formed in 1869, having been preceded by Charles Steer at the same address (80 Long Acre, London), who also manufactured playing cards during the 1850s and 60s. Sample books and price lists began appearing in 1870 offering a wide range of cards of different qualities, prices, designs and style, including Improved Ivory cards, rules booklets and Self-Scoring Cribbage and Bézique Markers. Willis playing cards were all of the double-ended courts variety, although early packs had one-way numeral cards. The court cards are in a decorative style. Willis & Co. also followed the trend in round corners and indices once these became preferred by card players. The designer/engraver Harrison Weir produced back designs for Willis & Co. The quaint Ace of Spades shows many similarities with the newly-designed Goodall Ace and may have been by the same artist (Cruikshank). There are no known Willis Jokers. 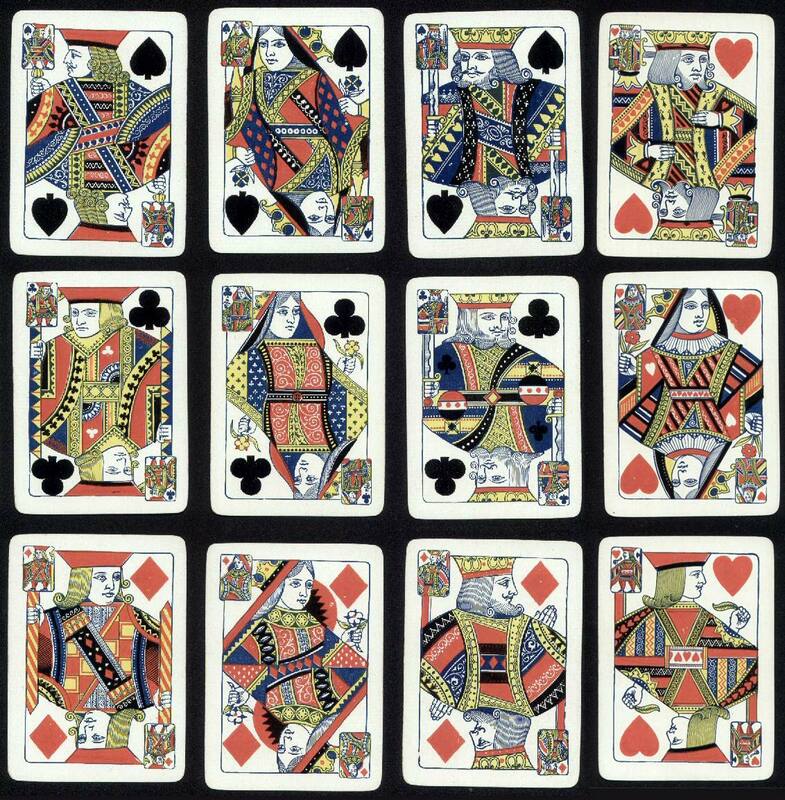 W. H. Willis & Co's range of standard playing cards included various qualities, such as: Court Moguls, Moguls, Oriental Moguls, Double Moguls, etc., Harrys, Gold Harrys, Third Harrys, etc., Highlanders, Best Highlanders, and so on. Above: cards by Willis & Co., c.1875, square corners, no indices. In the left-hand bottom row someone added index numbers in pencil, possibly imitating those already printed on other cards. Although the court cards are double-ended, the numeral cards are still single-ended. 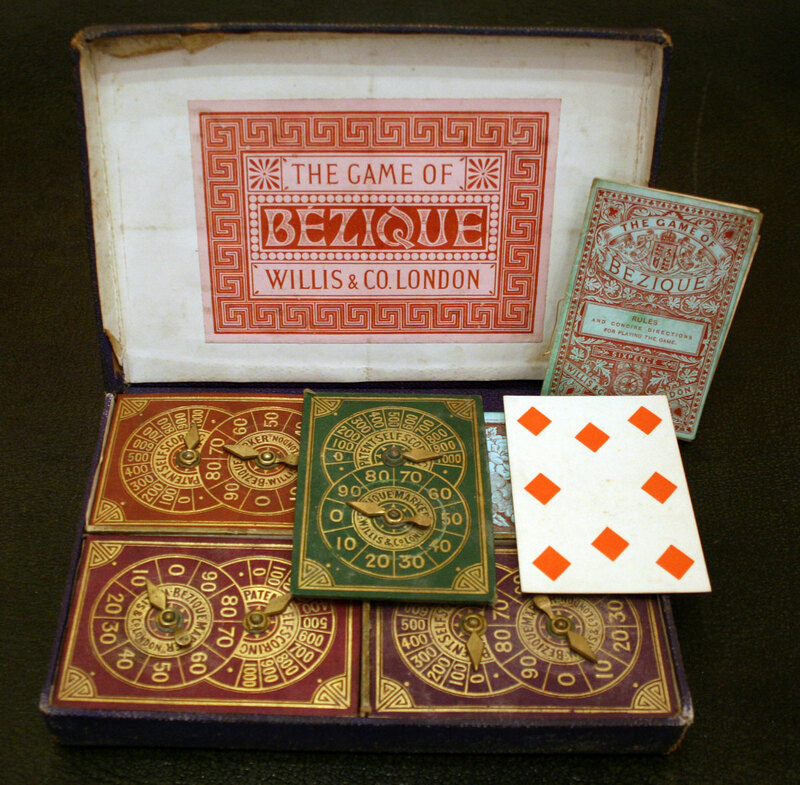 Above: following the lead of American manufacturers such as Dougherty and New York Consolidated Card Company, Willis & Co. introduced novel types of miniature corner indices to facilitate fanning or 'squeezing' the cards during the mid-1880s. The miniature 'triplicate' cards in the corners were apparently registered, and are ¾ or full-length figures. Interestingly the mini court indices are full length courts but Willis appeared never to manufacture full length court cards. Above: back designs by Willis & Co. These are described in specimen books as "Calico pattern", "Ornamental", "Ornamental Gold", etc. During the 1870s W. H. Willis & Co also produced a series of packs titled "Jockey Club" having on their backs the best known horse owner's colours, and also the boating colours of Oxford and Cambridge. During the 1880s Willis' price lists included various floral and ornamental back designs, and an "Alpine" series with ornamental designs, Swiss views, round corners and highly enamelled faces and backs. The business continued to expand during the 1870s and early 1880s and won prize medals at International Exhibitions. Then the playing card interests were wound down and sold off in 1887. 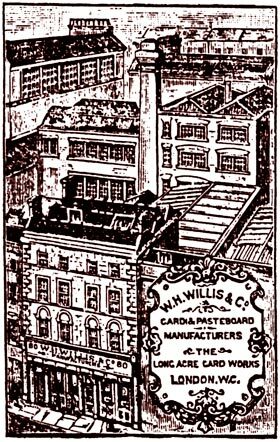 Subsequent efforts to re-start the firm's playing card production appear to have been in vain, although Willis & Co continued to operate as cardboard makers until around 1893. Willis & Co printed the delightful Political Pack shown below in 1886. The wholesale stationers Deakin & Company, of 45 Eastcheap, London EC saw the opportunity to publish a political pack with caricatures of political figures relating to the Irish Home Rule movement which was a contentious issue of the day. The packs were printed in three editions by Willis and Co., and the first edition in 1886 sold 60,000 packs in three months. In subsequent editions details on some cards were modified. 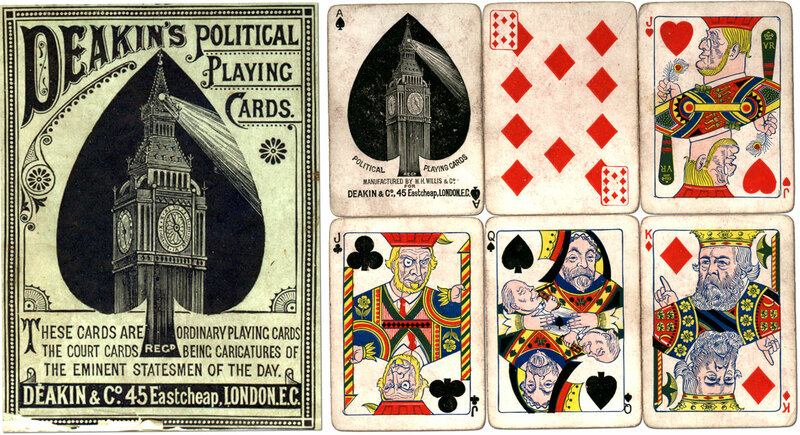 Above: Box and six cards from the 3rd edition (1888) of Deakin's Political Playing Cards, with caricatures of eminent statesmen of the day, which now has a special Ace of Spades featuring the same design as the box (note the "triplicate" indices). Goodall, Michael H., "Minor British Playing Card Makers of the Nineteenth Century Volume 1: W H Willis & Company," Woking, 1996.